After Hong Kong martial arts and wushu (“sword”) films became big in the 1990s, filmmakers who were not known whatsoever as action filmmakers like Ang Lee (Crouching Tiger, Hidden Dragon) and Zhang Yimou (Hero, House of Flying Daggers) cashed in on the craze by making artier “prestige” versions of the genre. Now, someone who was a Hong Kong action director but not known for his kung fu movies (which he did delve into early in his career) has added his contribution. John Woo (The Killer, Hard-Boiled) has fashioned Red Cliff, the most expensive Asian film ever made and it looks it. Woo’s primary inspiration however is less those classics of the wushu genre than it is Peter Jackson’s The Lord of the Rings. Red Cliff is grandiose filmmaking on the largest scale, both in physical size (2,000 people worked on crafting the sets) and length. The original version released in Asia took the form of two movies (think Kill Bill) with a combined running time of 288 minutes. This American version of Red Cliff is edited down to 21/2 hours. One would normally think this would make the movie worse as was the case with pared-down versions of Seven Samurai and Once Upon a Time in America. The negative consequence for Red Cliff is that some set pieces don’t get sufficient time to be built up and rounded out, but that’s outweighed by the trimming of an awful lot of dross – mostly excessive melodrama and some tonally bizarre comedy. Regardless of the editing, Red Cliff is apt to confuse American audiences. It’s based on a tiny portion of perhaps the single most famous story in all Chinese literature, The Romance of the Three Kingdoms, an enormously complex story with a gazillion characters, kind of like The Old Testament. The story begins with the callous warlord Cao Cao (Zhang Fengyi) pursuing the fleeing Shu Han people led by Liu Bei (You Yong) in the year 208. Cao Cao wants Liu Bei to ally himself with the Southlands’ young and inexperienced ruler, Sun Quan (Chang Chen), to give Cao Cao an excuse to conquer the Southlands. With no other choice, Liu Bei does just this through his emissary Zhuge Liang (the miscast Takeshi Kaneshiro), who is often called by his “courtesy name” Kongming. Zhuge Liang persuades Sun Quan’s most trusted advisor, Zhou Yu (Tony Leung), of the need to fight Cao Cao. At the battle of Red Cliff, Liu Bei and Sun Quan’s 50,000 men is vastly outnumbered by Cao Cao’s 800,000, and must look to Zhou Yu and Zhuge Liang’s war strategies as their only hope. The main characters are so well known to Asian audiences that Woo probably didn’t feel a need to give them much introduction or any back story, which is too bad from a basic storytelling standpoint but far worse for Western audiences unfamiliar with them. Still, the one thing Red Cliff is very good at is spectacle so it helps that literally half the movie is made up of action scenes. The climatic battle alone is nearly an hour long. The high points are when Liu Bei’s Tiger Generals go into action. Guan Yu (Bu Ba Sen Zha), the single greatest warrior in Chinese lore, is like China’s version of Achilles while Zhang Fei (Zang Jinsheng) is China’s Hercules and Zhao Yun (Hu Jun) is Sir Galahad. Woo uses CGI to the hilt to create eye-popping armies and battlefields and a fair number of “impossible” shots that would be more breathtaking if they weren’t clearly so impossible. Lots of aerial shots generate awe though seeing massive armies or hundreds of ships lined up to the horizon from high above. 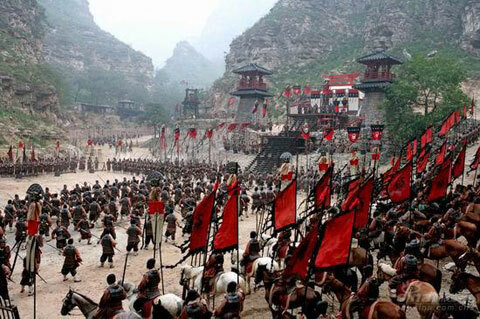 But outside of the huge CGI-ized battle scenes, Red Cliff has a generic epic feel that lacks much edge. The drama tends to be pitched over the top with a bombastic (though admittedly catchy) soundtrack. Before, Woo could pull off such extremes because he did it in an operatic fashion of gonzo emotion, but here it often comes off as inadvertently hokey. Actually, aside from Zhou Yu and Zhuge Liang’s manly bonding (which is just the opposite of what’s in the novel) and a Mexican standoff scene (with swords) near the end, if Woo didn’t have his name on the film, one would never guess he directed it. The movie takes a lot of liberties with the source material, which is not necessarily a bad thing with a story so convoluted. Only Woo’s substitutions don’t make it any less elaborate. Tony Leung’s Zhou Yu in particular becomes a lot more noble and central whereas he played second fiddle to Zhuge Liang in the original story. It’s no coincidence that Zhou Yu is now the main character and that Leung’s the biggest name actor in the movie (Chow Yun Fat was originally slated for the part until he had to drop out). Not surprisingly, the female characters play bigger roles than in the novel, although to do so, they have to engage in highly anachronistic behavior. Sun Quan’s sister, the Princess Sun Shang Xiang (Zhao Wei), is the most cartoonish character and is also involved in the most incredulous plot point in the movie. Still, due to Zhao’s lightly comical acting, she’s like a breath of fresh air compared to the humorless stiffs filling out the rest of the cast.